Still haven’t decided how to cast your vote in the 2019 Strongest Town contest? You’ve got until noon CDT on Thursday, March 28th — but maybe you could use a third-party perspective to help you decide which of our contenders have the makings of North America’s strongest town. If so, don’t worry: we’ve got you covered! As it turns out, the members of the Strong Towns movement are pretty much our secret weapon. You all have a wealth of experience, insight, and different perspectives on what makes for a strong and prosperous place. So we asked eight of you to weigh in with your own assessments of the eight remaining contenders. Specifically, these 8 member-written critiques address both what these towns are doing that really stands out in a good way—smart, tactical small bets on a financially sound and resilient future—and also what questions our members were left with after reading the contestants’ submissions. Give them a read, and then look below for the links to vote in our four Round 2 match-ups if you haven’t yet! What is one thing about this city (or that this city is doing) that most reflects a Strong Towns approach? What is one thing that seems to you to be an obstacle or challenge to this city’s present or future financial strength and resilience? Unfortunately, this desirable community faces a significant challenge in the area of housing. I lived in British Columbia for several years and remember hearing about how hard finding accommodation in Nelson could be. The team from Nelson recognized this situation in their submission, and they describe some strategies that the city government is taking to support residential development. These include reduced parking requirements and bylaw changes to make ADUs (accessory dwelling units) easier to build. What is one question you would like to see us ask this town’s representatives? I am interested in learning more about the redevelopment of the former industrial lands near the downtown. Is there community and government support to apply Strong Towns principles to the development of the “Railtown” neigborhood? What one thing about this city most reflects a Strong Towns approach in your opinion? Growth policies should encourage development first in those areas that can either use existing services or provide the greatest return per dollar invested to the city. • Identifies tax revenues from existing and probable future development in areas considered for annexation. • Calculates the costs and financing features for public improvements necessary to serve newly annexed areas. • Calculates the added annual operating costs for urban services, including public safety, recreation, and utility services, offered within newly annexed areas. The analysis should be structured as a ten-year operating statement. Generally, areas that reach an accrued break-even point meet an economic criterion for annexation. Like every city in Oklahoma, Guthrie is limited almost entirely to sales tax and utility fees for its revenue. Despite the intentional way Guthrie evaluates expansion and land use, the city previously annexed quite a bit of land. So with only 10,000 residents, the city must maintain infrastructure and services for the 19 square miles within its control. Fortunately, much of this land remains agricultural, requiring fewer resources to maintain than miles of low-density subdivisions. 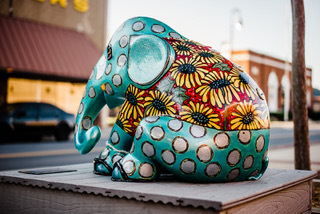 And by preserving its historic city center, hosting lots of festivals, and celebrating its unique role in the history of westward expansion, Guthrie attracts visitors and tax dollars that enable it to punch above its weight. Still, its economy remains heavily dependent on retail for revenues and jobs. What is one question you would like to see us ask this town’s representatives if they make it to the podcast/webcast round? When you talk to citizens of Guthrie, what do they say the city needs? How could you begin to address those needs using a Strong Towns approach? Delray Beach has managed to maintain a strong local economy. It is particularly impressive that the city’s business sector overwhelmingly consists of small and locally-owned businesses. One thing I think Delray Beach may struggle with in the long term is sea level rise. The city is looking at a $378 million project in order to mitigate this in the long term. Even if they succeed at this, the entire area struggles with the fact that the ground in that region of Florida is fairly porous, and this allows saltwater intrusion to potentially contaminate the Anastasia Formation which the municipality relies on for drinking water. I would ask a representative from Delray Beach how they plan to pay for the extensive capital projects needed in the future to pay for things like defense projects against rising sea levels, king tides, groundwater intrusion, and beach erosion. With 70,000 residents, will they be able to sustainably finance this off current income sources? A large part of Pensacola's economy is related to the military, specifically Naval Air Station Pensacola (NASP). The financial health of the region is interwoven with federal defense spending. Recognizing that dependency and encouraging local business creation and expansion is a way for the city to buffer itself from negative consequences of decisions beyond their control. Community leaders should be commended for cultivating entrepreneurship. Decision makers also appear to understand that land within cities is valuable, and that development is productive when it is placed where there is already public investment in utilities, streets, and services. The three acre mixed-use YMCA project described in the article appears to be beyond the scale of a small incremental change. Rapid transformations to neighborhoods can spark backlash from residents whose fears are not entirely unfounded. Does the city have a plan to address the challenges—increased rents, traffic congestion, parking scarcity—that accompany becoming a place where people want to be? Did the upzoning that permitted the intensification of the downtown site allow that new development by right? What barriers would be in the way of someone trying to do a similar project, or to do a smaller project, adding value to a downtown location? • What one thing about this city (or that this city is doing) most reflects a Strong Towns approach, in your opinion? One example is that for decades, our leaders always complained that 80% of our county was federal land. Now we embrace this situation and are using this as an opportunity for growth in outdoor recreational opportunities and creating an outdoor identity. Erwin highlights their efforts to leverage abundant outdoor recreational opportunities and an outdoor identity, due to the federal government owning about 80% of the land in the community. A town does well to maximizing its strengths—outdoor opportunities in this case. They also highlight some of the small businesses and tour guides who make up the bottom-up action at a personal scale. This strategy is a very Strong Towns-esque approach. • What is one thing that seems to you be an obstacle or challenge to this city’s present or future financial strength and resilience? Unicoi County has 18,000 residents, with 6,000 in the Town of Erwin. Our largest employer is BXT, Nuclear Fuel Services. They are the only supplier of nuclear fuel for US Navy submarines. There are 1000 high paying, technical jobs at this plant. Erwin's a town of about 18,000; its largest employer is BXT, which employs about 1,000 people. A single employer with this high of a percentage of direct jobs, and related jobs, represents a challenge to the city's future. Layoffs or a closure would have significant impacts to the town. There appear to be other large industrial companies nearby and in other parts of town, but jobs look to be mostly concentrated in a few parts of town. A more mixed-use, incremental, land-use approach to jobs could help Erwin better weather the ups and downs of major employers in the area. • What is one question you would like to see us ask this town’s representative(s), if they make it to the podcast and/or webcast round? What (land use) strategies are you looking towards to allow more infill development? Not many communities could boast about this, but most of Safety Harbor's roads are built very small. The representative mentions two stroads in their city—McMullen Booth Rd and State Highway 580—and while it looks to me like Philippe Parkway and Enterprise Road could be added to the list, most of the roads this town contends with are fairly well designed to the context of their setting. It's also obvious, based on the brick features on Main St. and the installation of pedestrian safety features like the RRFBs mentioned, that the leadership is not ignorant of potential lapses in safety and of the benefits of slowing the cars. Large, mature trees complemented by strategic street trees help most of the roads feel less like a highway and more like a cozy living room for greeting the neighbors. As with most communities, the highest risk of potential future failure in Safety Harbor lies with growth. The town has reached a mostly built-out state (which is usually a healthier place to be than having unlimited greenfield sites), but this is going to cause some growing pains. Where will new growth go? Will it grow upward, or will it swallow older, established neighborhoods? Will they provide more parking to draw in more tourists or residents, or will they continue their focus on strengthening the existing town structure and turning their “20-minute neighborhoods” into “10-minute neighborhoods”? Will the vast expanses of residential areas be kept under glass by NIMBY activists, or will they welcome new neighbors and new businesses into a more beautiful tapestry of community life? Two litmus tests I would place on this: first, a town growing stronger would not use the city-reserved space on Philippe Parkway to add driving lanes, but for much more beneficial uses. Second, a town growing stronger would ensure that city administrative institutions are encouraging the proliferation of local businesses, including drawing local grocery sales into the small food-desert of the city core. Core areas of town naturally expand with the influx of residents and businesses under the right conditions. What will the expansion of your core areas look like in 50 years, and how will you get there? • What is one thing about this city (or that this city is doing) most reflects a Strong Towns approach, in your opinion? Some may say that New Rochelle’s location is its biggest asset as it rests along the Long Island Sound, which contributed greatly to early settlement and current recreation opportunities. However, a sense of community is likely the best thing New Rochelle has going for it. New Rochelle appears to be one large, winding subdivision without any sense of a transportation grid outside of its downtown commercial hub. This is likely the reason why the city earned the nickname of “City of Homes” in the early 20th century. That said, the sprinkling in of parks, schools, congregations, and smaller shopping plazas within and around the residential neighborhoods helps contribute to the feel of community in New Rochelle. To that end, there must have been a strong resistance to the development of stroads, as you would be hard pressed to find more than a couple examples in New Rochelle, save for a parkway on the northern corner of the city and I-95/New England Thruway, which were clearly developed regionally and not locally. • What is the one thing that seems to you to be an obstacle or challenge to this city’s present or future financial strength and resilience? While those who submitted on behalf of New Rochelle seem proud of their plans and visualization of the “New New Rochelle” with a new skyline including twenty high-rise developments, I believe this may be also one of their biggest obstacles to a resilient future. Financial strength comes from incremental growth. While the density of construction being proposed aligns with some principles of a Strong Towns approach, the significant push for simultaneous, large-scale projects may lead to fragility. One looming issue is the limited potential for adaptive reuse of such construction. Another is the forced change in operations and necessary heavy investment in emergency services equipment and training in order to properly serve this type of construction which is non-traditional in New Rochelle. Admittedly, my living in the Midwest induces some skepticism toward this type of development and shift from historic community norms, but New Rochelle may be able to justify and ultimately benefit from these large projects due to their proximity to Manhattan, The Bronx, and other major urban locations. I just warn against the challenges these projects may create in maintaining one of New Rochelle’s largest assets, its strong sense of community. • What is one question you would like to see us ask this town’s representative(s), if they make it to the podcast (semifinal) and/or webcast (final) round? Winning the Bloomberg Philanthropies Mayor’s Challenge is quite the accomplishment, as I live in a community which also received recognition and funding from the same organization. It is undoubtedly an asset to provide a strong technological backbone for your community in New Rochelle. Providing Wi-Fi, collaborating with local universities, and developing a start-up incubator are all good indicators of this. How do you plan to extend—or how are you already extending—these resources and opportunities to all of your residents? Portsmouth describes a healthy relationship between city leaders and strong citizens, including not just a range of traditional public engagement activities but also literal dialogue as a dedicated feature of city council meetings. This leads to a more open discussion than the arms-length, one-way acceptance of public comment that most elected bodies rely on. This relationship appears to support both the municipality and the broader community in tackling issues like transportation, energy, and economic development by taking on a large number of small bets. The community’s Round 1 entry describes challenges around land development: a perception that the historic downtown area is “done” and doesn’t have space for incremental development, and tensions around auto-dependent single-use commercial development and subdivisions at the town’s periphery. For Portsmouth to remain strong, I hope the community can use dissatisfaction with the recent, low-value development not to crack down on all development, but as a prompt for positive discussions of how to enable ongoing, incremental development within and around the traditional town center area. How is Portsmouth planning for severe weather impacts, whether today’s or in preparation for future climate change? The city’s location at the mouth of the Piscataqua River is both an economic and scenic asset—but the strongest part of the community, the walkable compact downtown and neighborhoods, are all closest to the river and potentially exposed to catastrophic flood risks. Cast your vote! Who should advance to the Semifinal Round in the fourth annual Strongest Town Contest? !